A serious collision involving a motorbike and caravan has closed a section of the A470 in Powys. 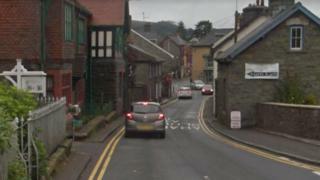 South Street in Rhayader has been closed between West Street and St Harmon Road following the accident on Saturday at about 13:00 BST. Dyfed-Powys Police advised motorists to avoid the area.